Lincoln Center for the Performing Arts has named pianist/composer Michael Brown a 2018 Emerging Artist, one of a select group of rising young talents associated with Lincoln Center’s eleven resident organizations. Brown was nominated for the prestigious award by the Chamber Music Society of Lincoln Center, where he has been on the roster of CMS Two since the 2015-16 season. The 2018 Emerging Artists will be celebrated March 1 at 6 pm at Lincoln Center’s Stanley H. Kaplan Penthouse, in a ceremony featuring live performances by Brown and several other awardees. 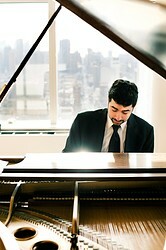 In addition to the Chamber Music Society—with which he performs frequently in New York and will undertake a two-week national tour in January 2018—Brown maintains an active schedule of recitals, orchestral engagements, chamber music collaborations, and appearances with his regular duo partner, cellist Nicholas Canellakis. He is currently Composer-in-Residence with the New Haven Symphony Orchestra, which has commissioned his first symphony and will premiere it in the spring of 2019. His most recent CD is an all-Messiaen release from the Seattle Symphony and Ludovic Morlot, where he appears as soloist in Messiaen's Trois petites liturgies de la présence divine. A world premiere recording of Samuel Adler’s First Piano Concerto, recorded by the Brandenburg State Symphony of Frankfurt, will be released by LINN Records in February 2018. Brown's next solo CD, featuring music by Beethoven, Mendelssohn, Bernstein, and Brown, is scheduled for Spring 2018 release on First Hand Records. To read more about the 2018 Emerging Artists, read the full press release from Lincoln Center.